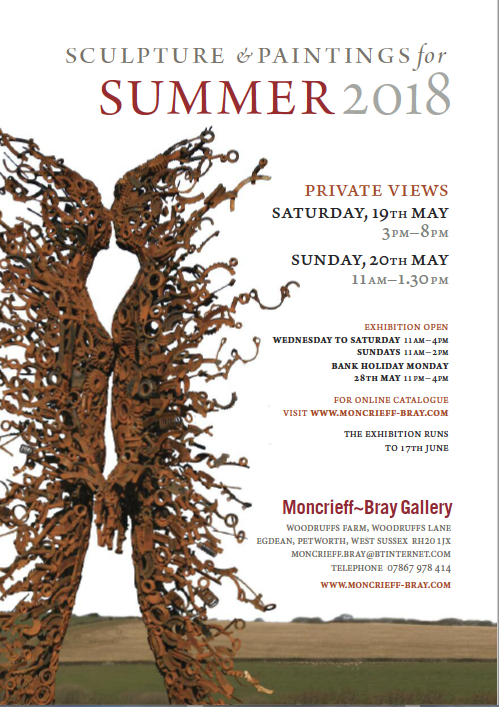 exhibition, with works displayed in the magnificent Sussex barn and sculpture arranged across the surrounding three-acre rural gardens.Selected with a commitment to quality, innovation and originality, a wide range of work will be on show; small-scale sculpture and paintings in the gallery, and in the garden large-scale works in all media, both abstract and figurative – many of which have been commissioned specially for the exhibition.Penny Hardy’s life size The Kiss is the perfect image to feature, since the show opens on the day of the Royal Wedding. It seems to move in the wind although made entirely of recycled scrap metal. Trudy Redfern, painter of the Queen’s horses, has sculpted a life-size driftwood horse after combing the beaches of Britain during the winter storms. Jilly Sutton’s Architect, cast in verdigris bronze resin from the original wood assemblage, reflects the chaos and resolution associated with building projects.Interior pieces include Nicholas Lees’s sculptures made from hand thrown porcelain which is then turned on the wheel. Their subtle surfaces set up shimmering patterns of optical illusion. Stuart Anderson works directly in clay from his subject. He has a special affinity with horses and greyhounds as subject matter capturing, the sheer joy of natural rhythms of line and form. Arabella Brooke represents women,challenging conventional ideas about female beauty and womanhood, and exploring identity and relationships. The artists on show are drawn from all corners of the British Isles.